When it comes to spooky stories, Peripheral Visions has both in quantity and quality. 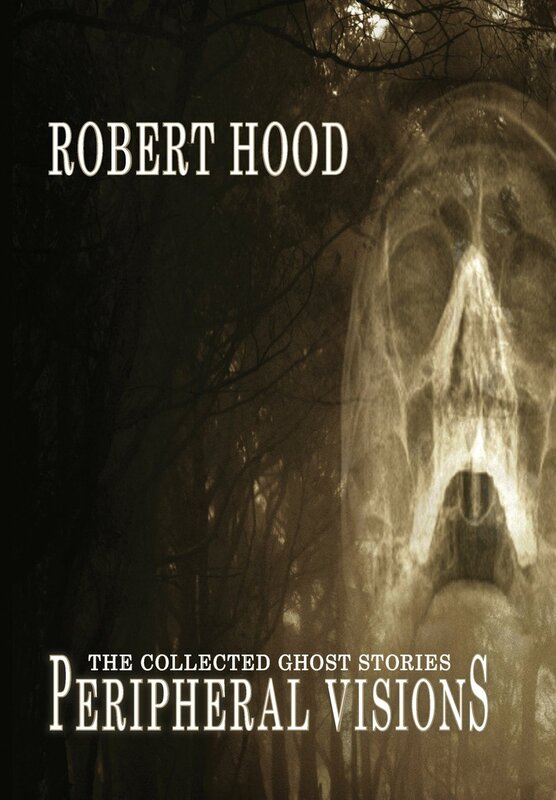 The collection contains forty-four horror stories by Australian author Robert Hood, written over the course of three decades. That's a lot of scary tales—the hardcover edition clocks in at eight hundred and twenty-four pages. While billed as a collection of ghost stories, a better description is that it features stories of things (people, places, items) that are "haunted" in one sense or another (the book is broken up into different sections depending on what the focal point of the story is: "Haunted Places," "Haunted Families," etc). Most of the tales stray far from familiar Victorian ghost story trappings, instead drawing on inspiration from every corner of the globe. For example, there are not just one but two stories that draw inspiration from kaiju/giant monster films. But what's even more impressive is the fact that these two giant monster stories are as different as night and day—"Ground Underfoot" is a melancholic story about humanity's futile last days, while "Walking the Dead Beat" is a pulpy, cheeky urban fantasy detective story. It's indicative of the collection itself, where in one section you might find a sweetly sentimental story, followed up by something really gruesome, which is followed in turn by a darkly comedic piece. It's impressive that Hood can tackle a seemingly done-to-death genre like ghost stories and find multiple new angles. But the Pincushionman is almost too effective. His presence promises gore and violent sexuality, and while the story feints in that direction it never really delivers. Someone close to Eriana does meet an ambiguously sticky end—was her jerk of a boyfriend "popped" by the Pincushionman, or did he die in a car accident like it says in the official police report?—but the heart of the story is really Eriana's struggle to make something more of her life. In the end, instead of getting "popped" herself, it's the hope she carries around inside that gets destroyed. The story ends on a depressing note with Eriana seemingly losing the will to care. It's a sad scene, but rather low-key for a story that features a creature as otherworldly as the Pincushionman. Halfway through the book there is a bit of a breather in the "Haunted Youth" section. This section features children and teen protagonists, but more importantly, it features stories aimed at kids the same age. In his story notes, Hood writes that he hopes the stories can be enjoyed by people of all ages, and they totally can be—the stories are fun and clever. But Hood also treats his younger protagonists with kid gloves, letting them off easy where an adult protagonist might be made to suffer. Warwick's list of nasty habits are endless, and when Grace—his mother—accidentally backs the car over him she's wracked with guilt. But slowly, she starts to enjoy her calm, peaceful life without Warwick . . . until evidence of his nasty little habits start showing up again. In the afterword Hood writes that he was surprised by how well received this story was by young mothers (even if they were sheepish to admit it). While Hood has lots of unique takes on ghost stories occasionally he too falls into cliché. The section "Haunted Vengeance" in particular is a bit of a disappointment, perhaps because we are so used to seeing ghost stories as revenge stories that even Hood can't put a fresh spin on it. "Housewarming" is Hood's take on 80s slasher teen movies, and he is a little too faithful in recreating the genre. It regurgitates old horror tropes instead of examining them (for example, the so-called slutty girl in the main cast is singled out and lectured by the villain before being murdered). There's also a couple of stories featuring men killing/beating women and then getting their comeuppance. The problem is that the beating/killing of women takes up so much more space in the story than the comeuppance, and even though Hood is a good writer it's just a story I have seen too many times before too enjoy. The "Haunted Vengeance" section does have a story I really enjoyed called "After Image," though I'd argue that it doesn't really have much vengeance in it and would be better suited somewhere else in the book (then again, each section has a story or two that might fit better else. Po-ta-to, po-tah-to). "After Image" is almost a workplace comedy about a frazzled reporter trying to write a serious story about a missing kid while everyone else pressures him to include a juicy side article about a guy who takes photos of ghosts. When the twist comes it goes from being darkly humorous to actually scary. Even if not every story connects, most of them have a unique idea at their core. Hood is a solid writer. His style is very much in the vein of Richard Matheson and Stephen King, clear and down-to-earth while still evocative. He's also like those writers in that he has had consistent, prolific outpoint over the course of his long career. While reading I tried to see if I could peg the stories chronologically, to see how Hood's style changed over time, but the only time I was ever really able to place a story was when it mentioned a modern convenience (interestingly, the older stories don't have such tells—no one listens to 8-tracks, for example). In the afterword Hood says that this is a complete collection of the ghost stories he's written, but that within a few years it'll need to be updated as he plans to keep writing them. It's that kind of chutzpah that shines through in this collection. Hood doesn't just write good ghost stories—he really loves them. Shannon Fay is a freelance writer who has recently moved from Canada to the UK. She has also recently released a collection of short stories called Clever Bits . She can be found online at www.ayearonsaturn.com or @ShannonLFay. Shannon Fay is a Canadian writer living in Nova Scotia. She can be found online @shannonlfay or www.ayearonsaturn.com. IRL she can usually be found in her kitchen cooking or in the living room watching horror movies.